[123 Pages Report] The global high strength aluminum alloys market was valued at USD 35.26 Billion in 2017, and is projected to reach USD 55.24 Billion by 2023, growing at a CAGR of 7.8% between 2018 and 2023. Following are the years considered for the study. 2017 has been considered as the base year for company profiles. Whenever information was unavailable for the base year, the years prior to it have been considered. Different secondary sources such as company websites, encyclopedias, directories, Associations (Aluminum Insider, World Aluminum, and European Aluminum) and inhouse-databases have been used to identify and collect information that is useful for this extensive commercial study of the global high strength aluminum alloys market. The primary sources, which include experts from related industries, have been interviewed to verify and collect critical information as well as to assess the future prospects of the market. The top-down approach has been implemented to validate the market size, in terms of value and volume. With the data triangulation procedure and validation of data through primaries, the exact values of the overall parent market size and individual market sizes have been determined and confirmed in this study. 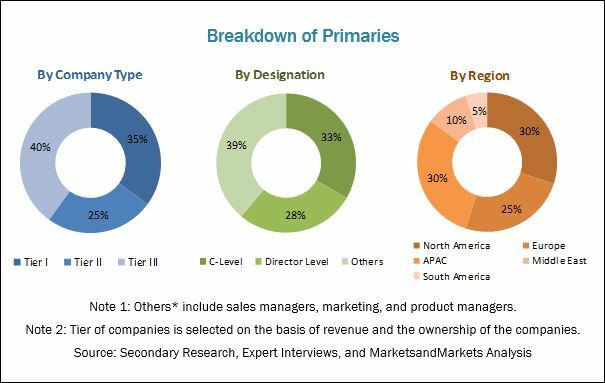 The market for high strength aluminum alloys has a diversified and established ecosystem of its upstream players such as the raw material suppliers, and the downstream stakeholders such as manufacturers, vendors, end-users, and government organizations. Most of the major players in the market for high strength aluminum alloys have done backward and forward integration to strengthen their position in the prevailing market. Some of the major raw material suppliers as well as manufacturers are Toray Industries Inc. (Japan), Teijin Limited (Japan), and Mitsubishi Rayon Co. Ltd. (Japan). This study answers several questions for the stakeholders, primarily which market segments to focus on in the next two to five years for prioritizing the efforts and investments. These stakeholders include the carbon fiber manufacturers such as the Rio Tinto PLC (UK), Aluminum Bahrain B.S.C (Bahrain), Norsk Hydro ASA (Norway), and among others. This research report categorizes the market for high strength aluminum alloys based on end-use industry, alloy type, strength and region. The global market for high strength aluminum alloys, in terms of value in 2018 was 37.94 Billion and is projected to reach USD 55.24 Billion by 2023, at a CAGR of 7.8% between 2018 and 2023. In terms of volume, global market for high strength aluminum alloys is projected to reach 11,477.9 kilotons by 2023, at a CAGR of 5.6% during the same period. The increasing stringent regulations for fuel efficiency and emission and growing use of high strength aluminum alloy in luxury car segment are key factors for the growth of the global market for high strength steel aluminum alloys. In terms of strength, high strength aluminum alloy market is segmented into high-strength aluminum alloys and ultra-high-strength aluminum alloys. High strength aluminum alloys represent aluminum alloys that have ultimate tensile strength above 300 MPa and Ultra-high strength aluminum alloys represents alloys with ultimate tensile strength above 400 MPa. The demand for High strength aluminum is mainly driven by automotive and transportation industry. Ultra-high strength aluminum majorly dominate in the aerospace and defense industry. High strength aluminum alloys are extensively used in automotive & transportation, aerospace & defense, marine, and other end-use industries. The high strength aluminum alloy market in the automotive & transportation industry is expected to grow at the fastest rate due to high penetration of aluminum in the industry and rapidly growing automotive market in APAC. The demand for ultra-high strength aluminum in the aerospace industry is driving the market for aerospace and defense segment. High strength aluminum alloys has been used in the automotive & transportation industry in many application like wheel rims, engine components, pistons, powertrain, front & rear longitudinal frame, and many more. APAC is the largest high strength aluminum alloys market, while Europe is the fastest-growing market for high strength aluminum alloys because of its increasing use in the automotive end-use industry. The growth of the high strength aluminum alloys market in APAC is mainly driven by growing demand for products with high tensile strength, corrosion resistance, low maintenance, recyclability and long shelf life in different end-use industries. The market for high strength aluminum alloys is rapidly gaining importance. However, few factors act as a bottleneck towards its growth in the global high strength aluminum alloys market. High production cost and availability of high strength composite material are the major restraints toward the growth of the high strength aluminum alloy market. The companies such as Rio Tinto PLC (UK), Aluminium Bahrain B.S.C. (Bahrain), Norsk Hydro ASA (Japan), Hindalco Industries Limited (India), Alcoa Inc. (US) are the dominant market players in the global high strength aluminum alloys market. 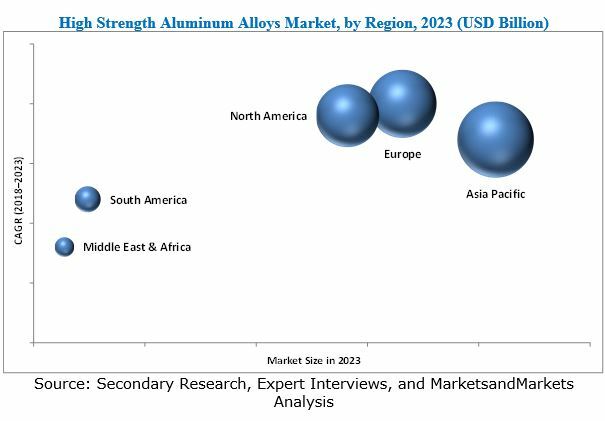 They have been adopting various organic and inorganic growth strategies such as agreements, joint ventures & collaborations, expansions, mergers & acquisitions, and new product launches & technology developments to enhance the current market scenario of the high strength aluminum alloys market.